This cake was for a special needs girl and her groups first ballet recital. It was white cake with vanilla frosting. It was inspired by a picture I saw in a cake book a few years ago. I started off with one 3 inch layer of cake. I cut it in half and put icing in the middle. 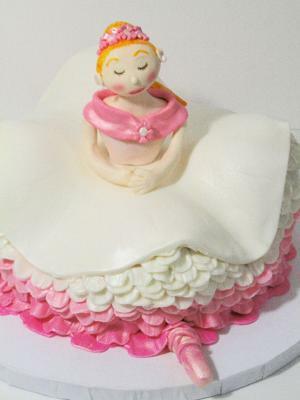 Then I carved out four triangle shaped chunks out of the cake, put a little icing under them, and placed them on the cake next to the cut out space to give the illusion of a flowing tutu. The rest of the cake them got a layer of vanilla icing. I took fondant and colored it three different shades of pink, then a ruffle cutter was used (or any cutter with ridges can be used), and rolled out with a toothpick to give it a little texture and frill. Each section was added to the cake starting with the dark pink on the bottom, and using the lighter pink and finally the white fondant for the top frills. Next I used a large circular metal ring that was 8 inches and cut out a piece of fondant to lay over the top of the cake. I made it a little thicker than normal so it could be easily stretched to fit the curves of the cake. Next I made the torse and feet out of gumpaste. I put the figure on a dowel, so I could easily insert it into the cake and it would be hekd in place. The arms were held in place with toothpicks, and the pink shawl was added after to hide the seams. The feet were carefully inserted under the ruffles making it look like the ballerina was doing the splits. I used small blossom cutters for the hair accents, and the shawl. The face is a mixture of gel food color for the eyes and hair, and luster dust for the cheeks and makeup. YOUR CAKE WAS SO DARLING, I JUST LOVED THE FACE ON YOUR BALLERIA, SHE LOOKS SO SO INTO HER DANCE. IT IS JUST ADORABLE AND VERY GOOD CLEAN WORK.